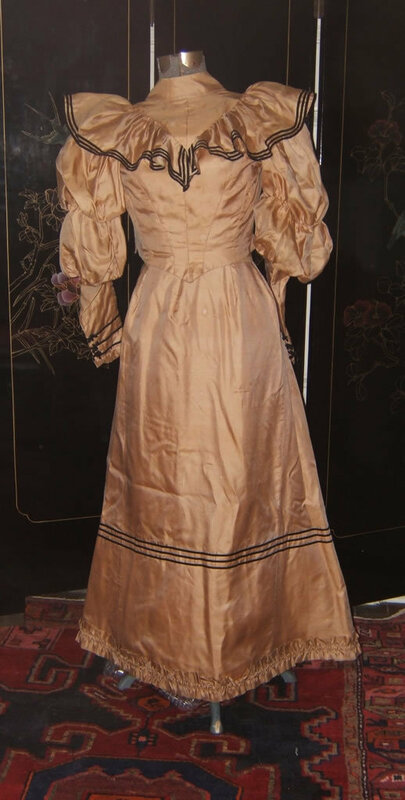 This fabulous example of a late 1890's dress is made from gold silk and is trimmed with narrow (1/4 inch) black velvet ribbon. 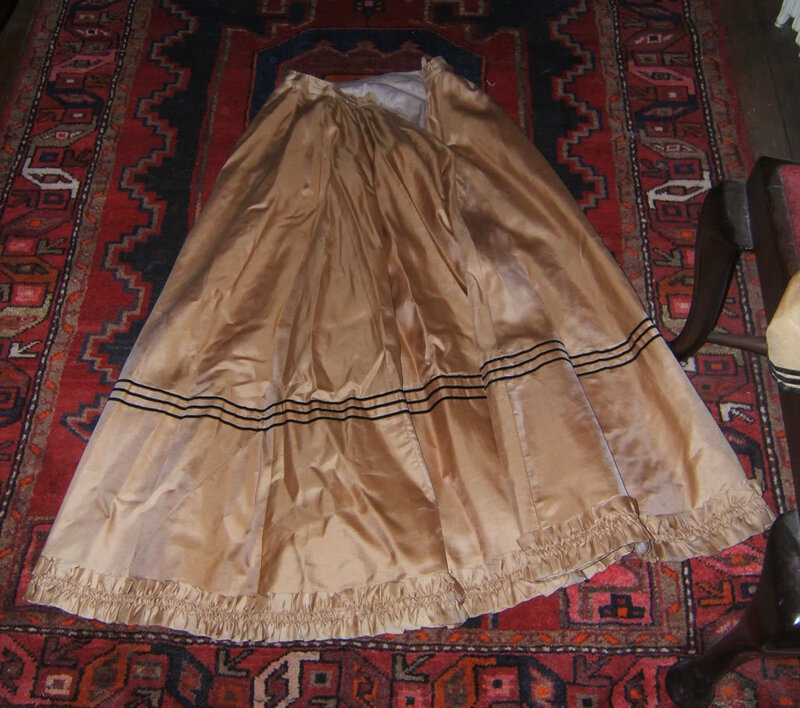 The skirt is five gore and is lined with tan polished cotton and interlined with crinoline at the bottom 13 inches up from the hem to help it stand out in the fashionable tulip shaped skirts fashionable in the 1890's. 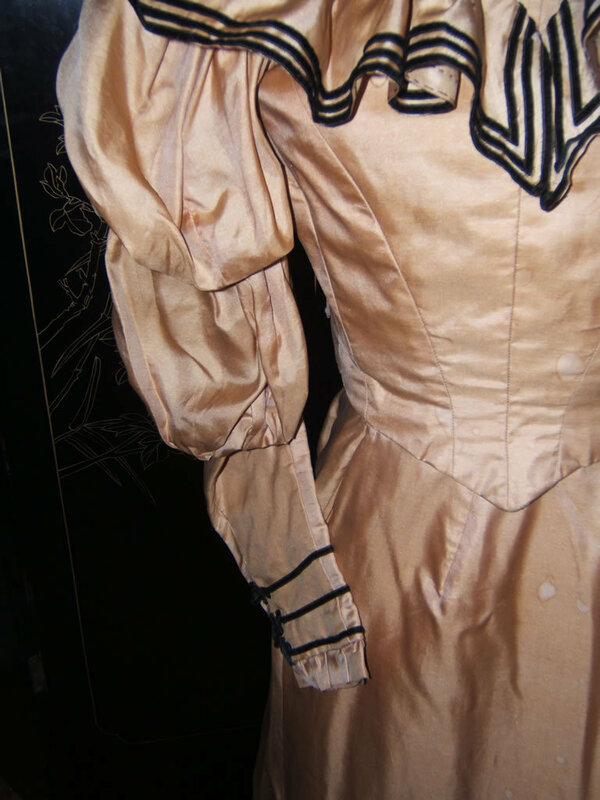 A double gathered rushing strip trims the hemline, and three rows of the narrow black velvet ribbon trim the skirt at the top of the interlining (this helps disguise the edge of the interlining). 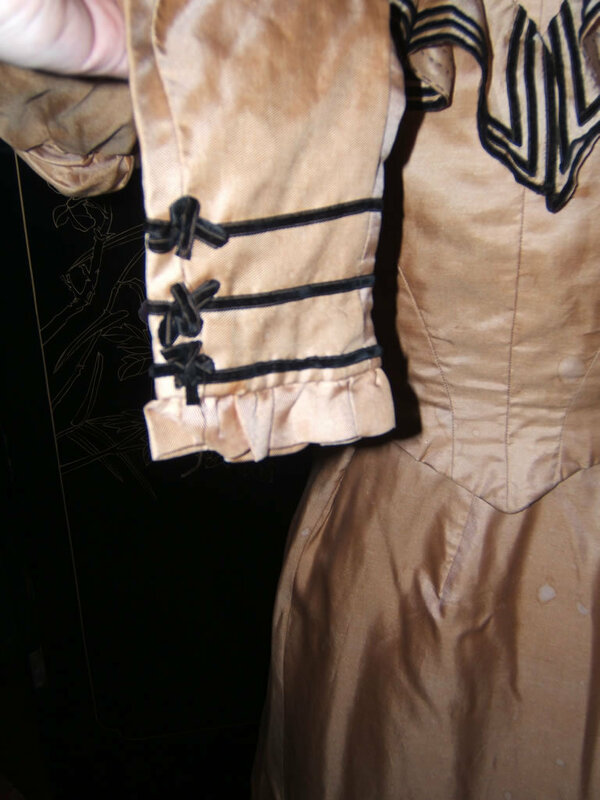 The bodice is fitted and closes in the back with period hook and eye tape. The front comes to a point at the waistline. The bodice has a high neckline with a standing collar and is trimmed with a self fabric ruffle, also trimmed with three rows of narrow black velvet ribbon, applied coming down to a point at the front and back and traveling over the shoulders. 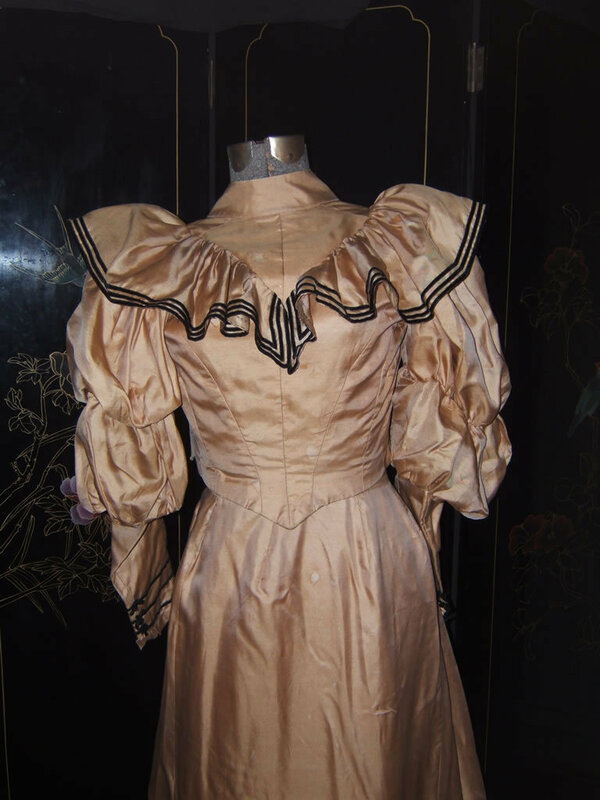 The sleeves are very full leading me to date this more between 1892 – 1895 as the sleeves were narrower before and after that time period. These sleeves are gathered twice – once at the top and again around mid bicep. They are gathered at the bottom into a fitted lower sleeve slightly below elbow level. 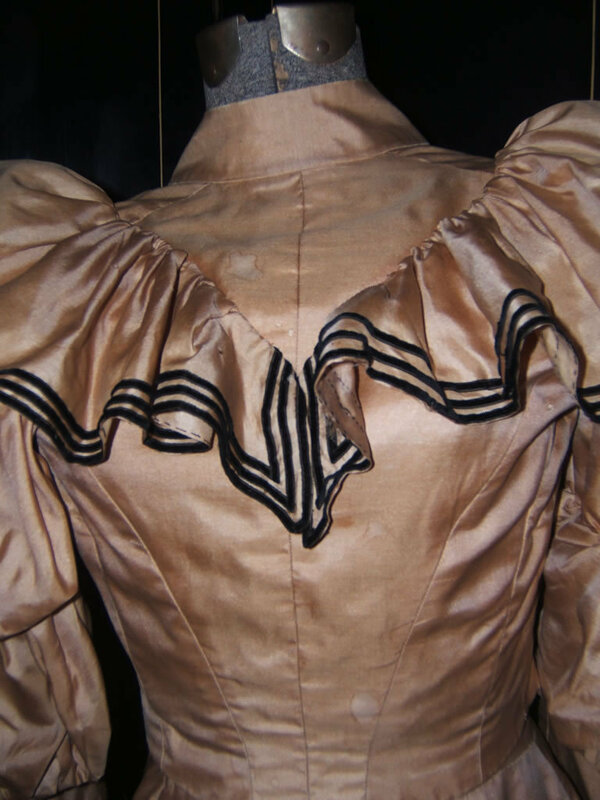 The lower sleeves are trimmed with a pleated ruffle and three rows of black velvet ribbon with small bows. 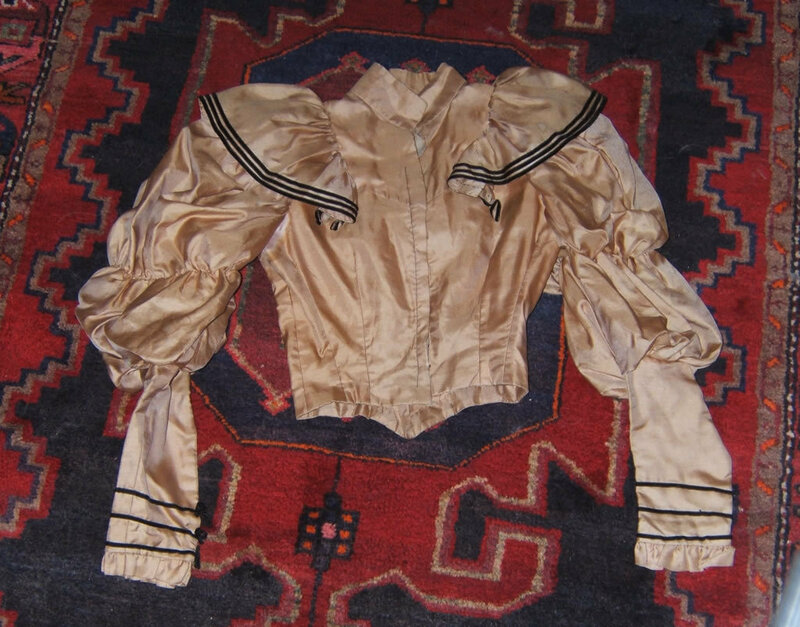 The bodice is lined with tan polished cotton and there are two boning channels, one on each side of the front, but one bone is missing. Damage: 4 tiny holes on bodice front (see photo), a few pin holes on the bodice ruffle, and a few water marks throughout, both on the bodice front and also the front of the skirt. 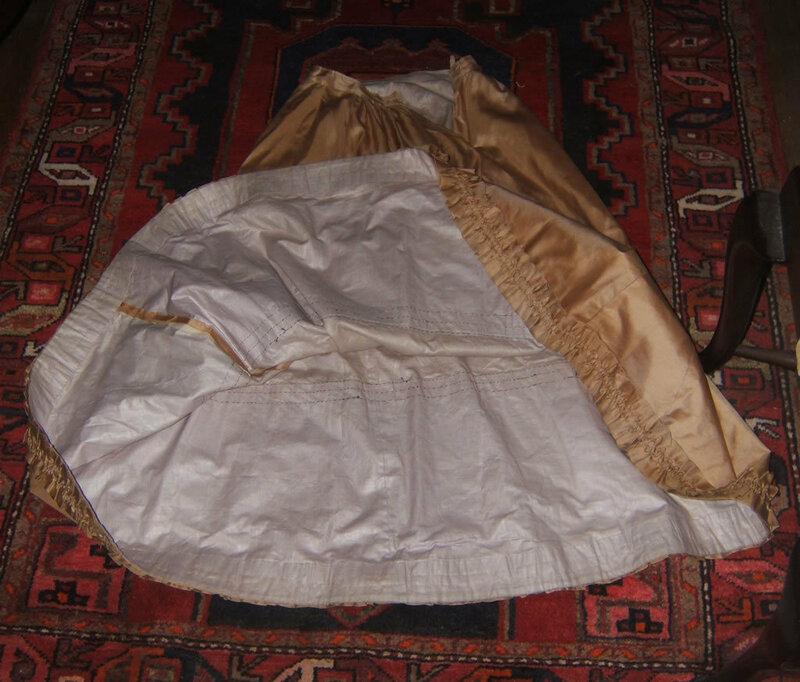 These might come out if the dress were dry cleaned, but cleaning and/or washing garments this old is always risky. 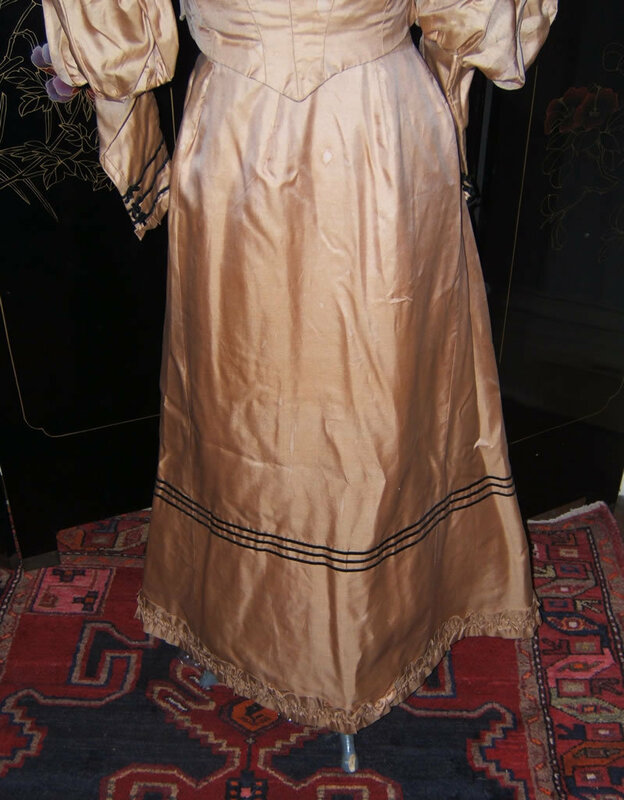 This fabric is not shattering as 19th century silk usually does (it is a ribbed silk slightly heavier than taffeta) so it might hold up, but there are no guarantees. The dress has not been cleaned or washed.